In a skillet sauté onion with olive oil and chipotle pepper for 3 minutes. Add chicken, brown on both sides then add broth, bay leaves and canned tomatoes, cover and simmer for 20 minutes until chicken is thoroughly cooked. Add red pepper, and if needed a little more broth and simmer another 10 minutes until chicken is falling apart. Let cool down and shred chicken by hands. The mixture should result well combined but still slightly brothy. 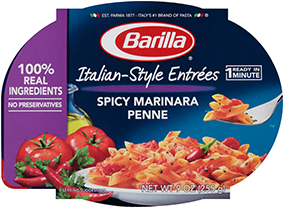 Cook pasta according to package directions, but drain 2 minutes earlier reserving ½ cup cooking water. Toss pasta with chicken sauce over high heat until remaining liquid is absorbed and Gemelli are perfectly cooked, about 2 minutes. Stir in roasted okra, cheese, and pesto before serving.